Six capacitive buttons surrounding an OLED display make up Hexiwear's user interface. A double tap on any of the buttons will wake up the device and light up the OLED display to show the home screen. If double taps don't wake up the device, the battery is probably empty. Connect Hexiwear to a power supply through the Micro USB port on the side. Charge for a while then try again. From the home screen, a single tap on the lower right button will bring you into the menu. Use the pair of buttons to the right side of the screen to browse through the list of available items. Two dots on the right edge of the screen are visible wherever vertical scrolling is available. The two buttons below the screen are for entering and exiting folders or turning settings on and off. If you are left-handed, you can set up your Hexiwear so that the buttons on the left side of the screen are used for vertical scrolling. From the Home Screen, go to Menu >>> Settings >>> Active buttons. If the Hexiwear unit becomes unresponsive, you can reset it using the button on the rear side. You will need a pin, needle, paper clip, or similar item to press reset (same type of tool used for ejecting SIM cards out of cell phones). The following is a full list of components inside Hexiwear with links to relevant data sheets. The following is an overview of all the applications and settings on Hexiwear. 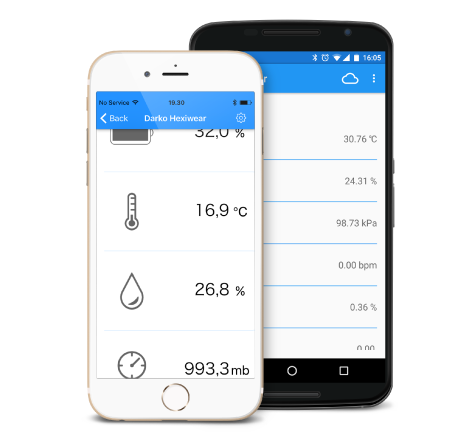 Shows ambient temperature, humidity and pressure data in real time. Step and calorie counter next to each other. Walking steps are inferred from accelerometer readings. Calories are calculated using a formula. "Stop" button resets count. Heart-rate readings from the optical sensor. Two wavelengths of light from two LEDs (red and green) are emitted from the small slit on the rear of Hexiwear. When you place your wrist or fingertip over the slit, the sensor measures the light absorbance of pulsing blood through a photodetector and derives heart-rate info. Current firmware version is able to show rough estimates. A more detailed overview of smartphone notifications visible from the home screen. Displays the number of missed calls, unread messages (from Gmail inbox) and unread SMS messages. Requires Hexiwear to be paired with a phone. Updated in real time. Toggles bluetooth on and off. White when turned OFF, Blue when turned ON. OTAP stands for "Over the Air Programming e.g. wireless firmware updating. You can choose to update either the KW64 (main MCU) or the KW40 (BLE chip). Requires Hexiwear smartphone app. See this video for instructions. Sets active buttons to either left or right side (used for vertical scrolling). Left-handers will want to set it to the left, in order not to obstruct their view of the screen while tapping buttons. Toggles haptic feedback engine on and off. White when turned OFF, Blue when turned ON. Haptic engine gives tactile feedback on button presses. Deactivating it conserves battery. Displays QR codes for fetching and installing the Hexiwear smartphone app. Choose between Android and iOS. Requires a QR Code reader on your smartphone. Alternatively, you can download the apps directly from Google Play or the iTunes store. Manufacturer info, hardware and firmware version. Toggles Sensor tag mode. When active, Hexiwear will continually broadcast readings from all its internal sensors over BLE. The readings can be accessed from the Hexiwear smartphone app, or directly from the WolkSense cloud. White when turned OFF, Blue when turned ON. The Hexiwear smartphone app will significantly expand the functionality of your Hexiwear. 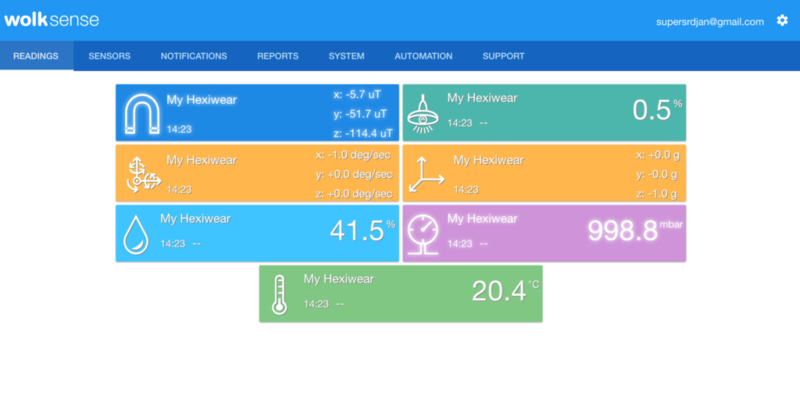 It will allow you to remotely access the readings from all of Hexiwear's sensors, and log the data into a cloud. Since Hexiwear uses Bluetooth Low Energy for wireless communication, you will need a phone that supports Bluetooth 4.1. A video walkthrough on using the Hexiwear app is available on Youtube. Minor differences from the current version of application may exist. From the main screen, swipe down to scan for available Hexiwear devices; select one. 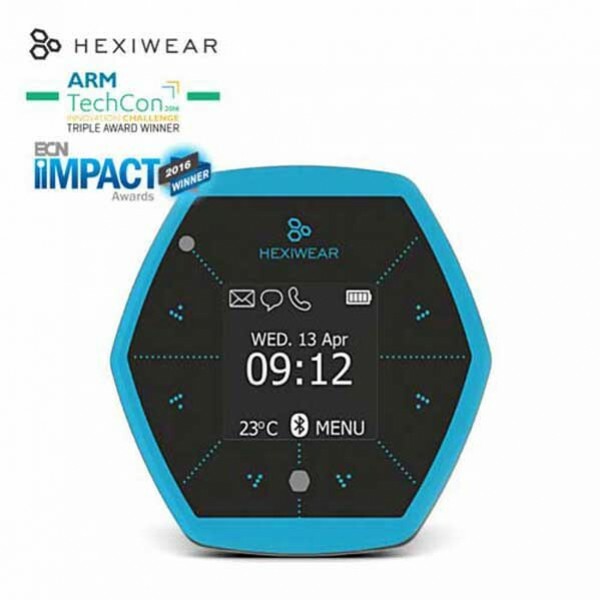 A six digit passkey will appear on Hexiwear's display. At the same time the smartphone app will prompt you to type in the passkey. Hexiwear is now connected to your smartphone. Sensor readings will appear shortly. If errors occur, to restart the pairing process, go to the Bluetooth settings on your smartphone and "forget" the Hexiwear device. This removes all the initialization data and enables you to start over. 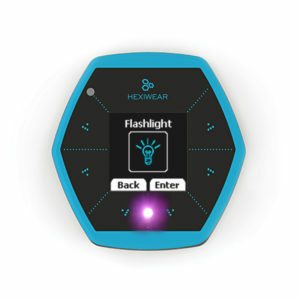 Go to app.wolksense.com, and log-in with the same username and password you use for the Hexiwear smartphone app. Once logged in, you will be able to use all the functionalities that the Wolksense platform offers: sensor readings, alarms, reports and more. The first thing you see when you log-in to the Wolksense cloud is a dashboard with sensor readings. The dashboard is customizable so you will be able to choose which sensor readings you want to see. 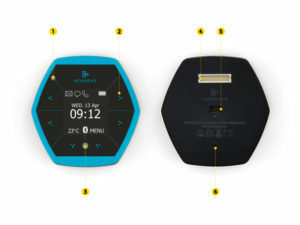 By default, Hexiwear will publish sensor readings every 10 seconds. You can increase the interval to 30 seconds, 1 minute, or 5 minutes from within the smartphone app. The Wolksense platform also allows you to configure thresholds for each sensor to set off alarms when certain low or high values are reached. 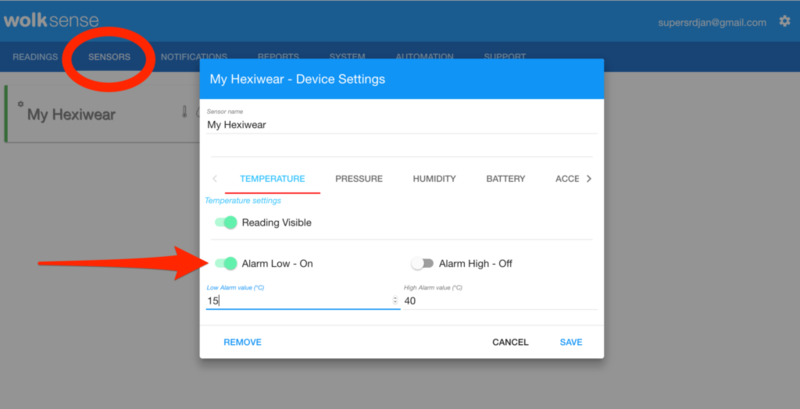 To set alarms, click on the "Sensors" tab and open the Hexiwear device settings. You can apply different settings for individual sensors. 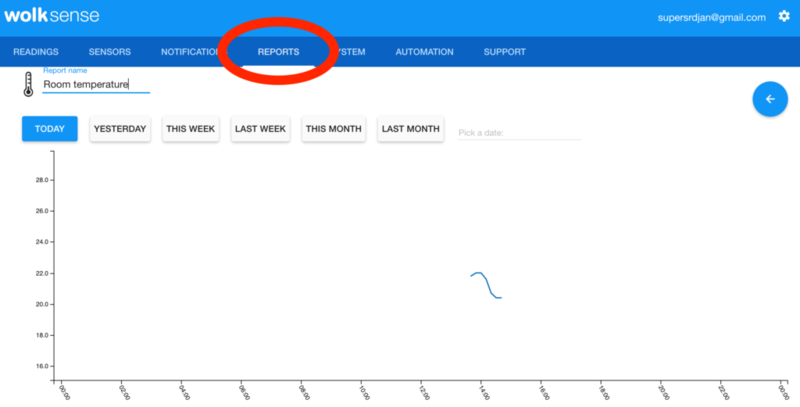 The "Reports" tab on the Wolksense cloud will allow you to generate reports of logged sensor readings. Graphs give you daily, weekly and monhtly views. It is also possible to export data into a CSV file. The Hexiwear Docking Station is an expansion board that provides an interface for programming, debugging, and enhancing Hexiwear with additional functionalities (by adding click boards™). The Docking Station vaslty increases the possibilities of Hexiwear as a development tool. 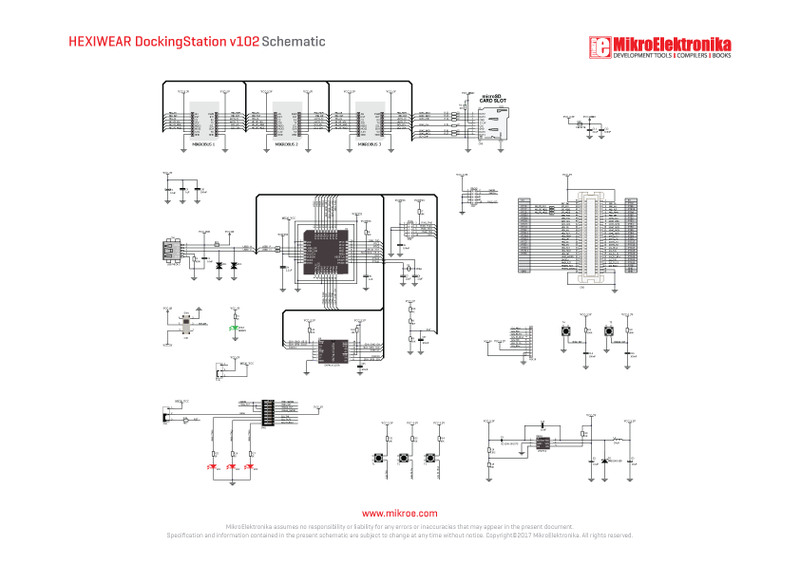 For more information, read the Docking Station User Guide. Step 1: Jump Start Your Design with the NXP Kinetis SDK! The Kinetis Design Studio (KDS) is a complimentary integrated development environment for Kinetis MCUs that enables robust editing, compiling and debugging of your designs. 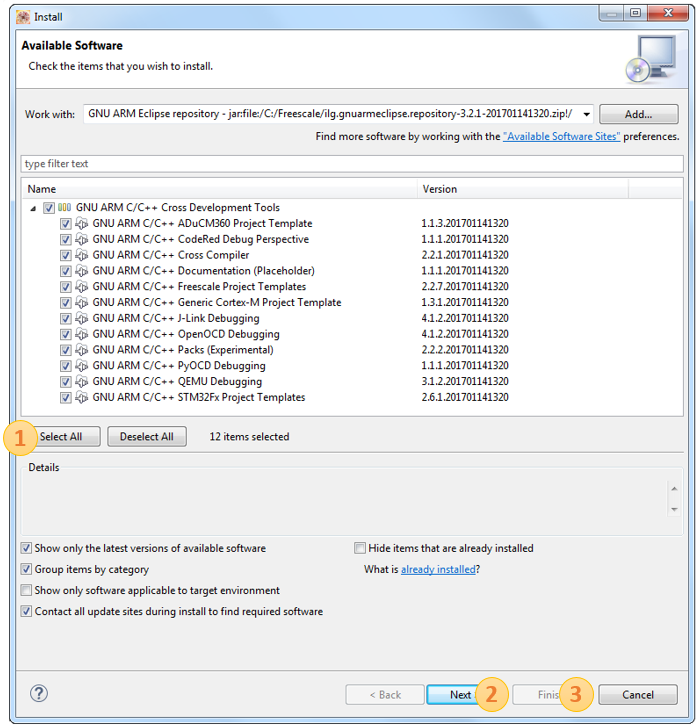 Based on free, open-source software including Eclipse, GNU Compiler Collection (GCC), GNU Debugger (GDB), and others, the Kinetis Design Studio IDE offers designers a simple development tool with no code-size limitations. Hexiwear default software can be modified in the KDS. 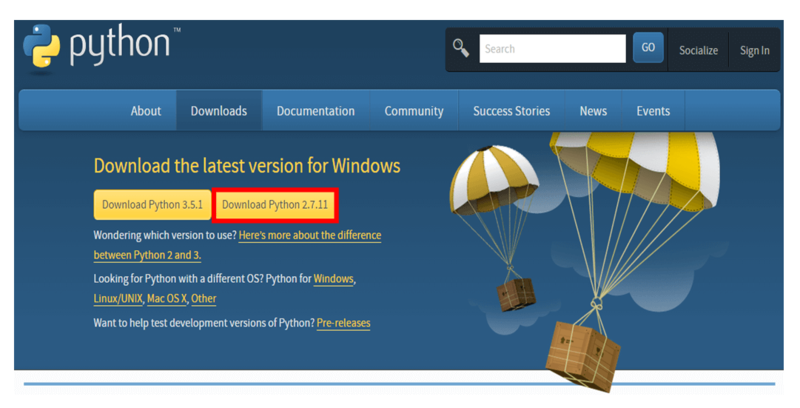 Download the latest version on KDS. Download the serial UART driver. With the serial port driver installed, run your favorite terminal application to view the serial output from the MCU's UART. Configure the terminal to 115,200 baud rate, 8 data bits, no parity and 1 stop bit. 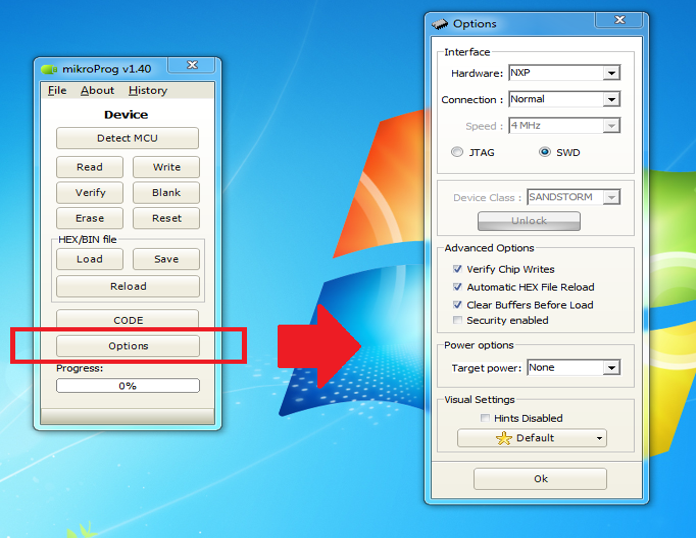 To determine the port number of the Hexiwear's virtual COM port, open the device manager and look under the "Ports" group. Once the download is complete, extract the content of the HEXIWEAR-master.zip on your computer. 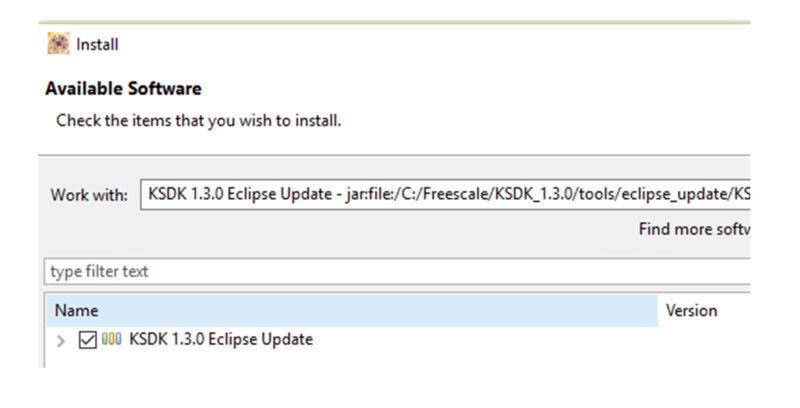 Before using Kinetis Design Studio IDE with Kinetis SDK, the Kinetis SDK Eclipse update must be applied. 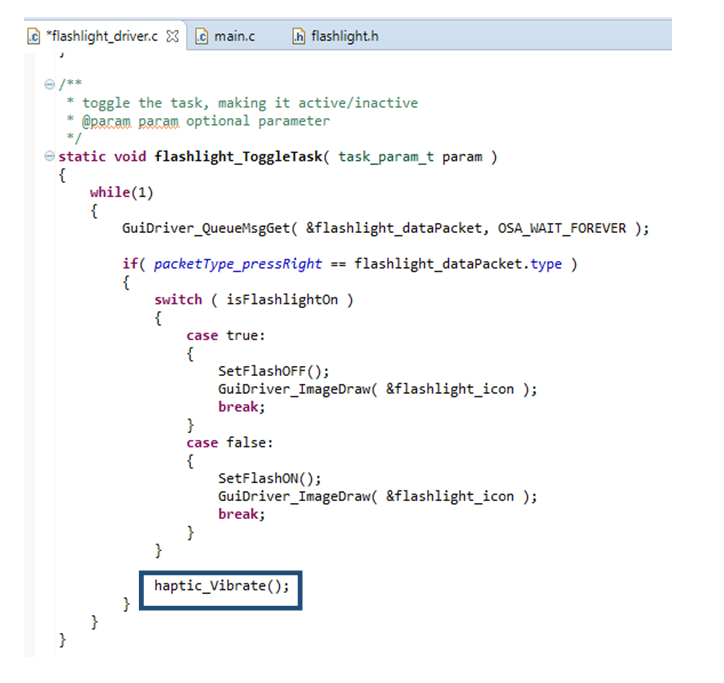 Without this update, Eclipse cannot generate Kinetis SDK-compatible projects. Open Kinetis Design Studio. The program will ask you to select a workspace. Select default workspace. 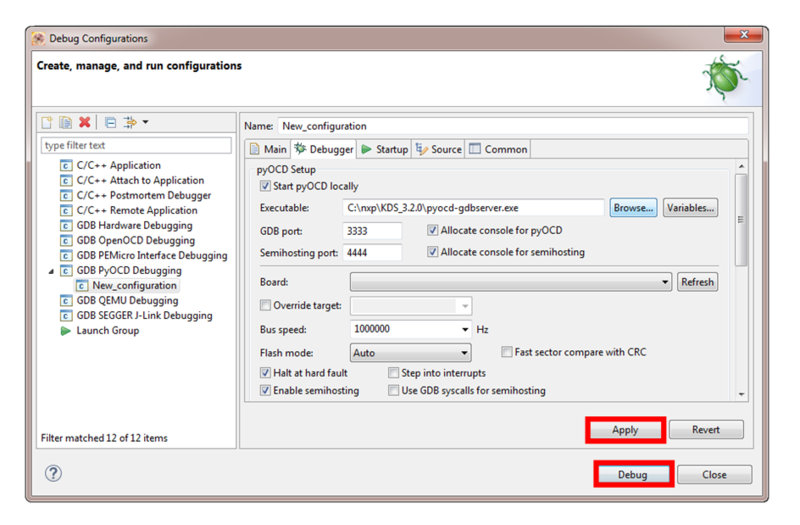 Click Open and the OK button in the Add Repository dialog box. Check the box to the left of the KSDK 1.3.0 Eclipse Update and click the Next button in the lower right corner. Follow the remaining instructions and Accept the licensing to finish the installation of the update. After the update is applied, restart KDS for the changes to take effect. 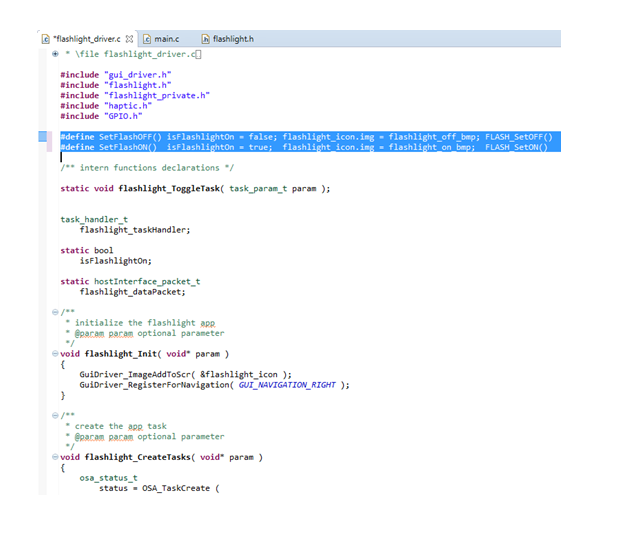 In order to program/debug Hexiwear via its docking featuring an ARM DAP-LINK Debug, virtual Serial and Flash programming interface, we need to upgrade Eclipse with the PyOCD plug-in. 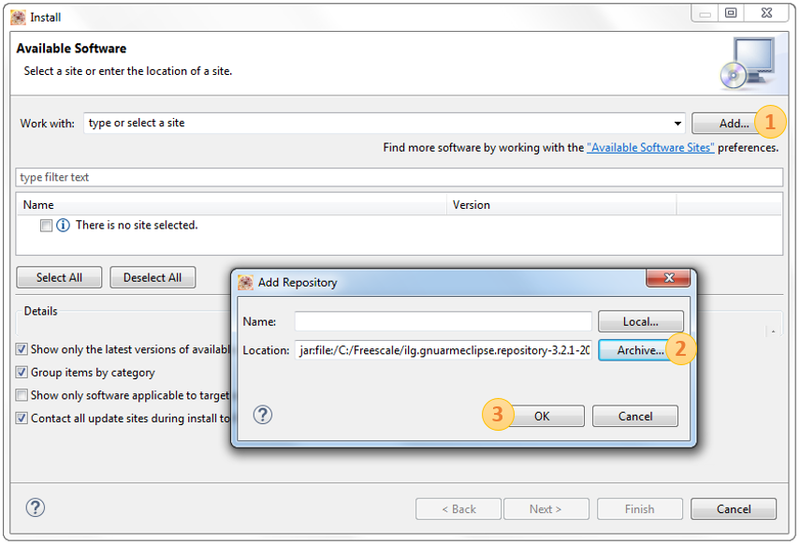 Double click on the installer located in your download directory and follow the instructions. Now let’s upgrade Eclipse with PyOCD plug-in. Select File, Import from the KDS IDE menu. 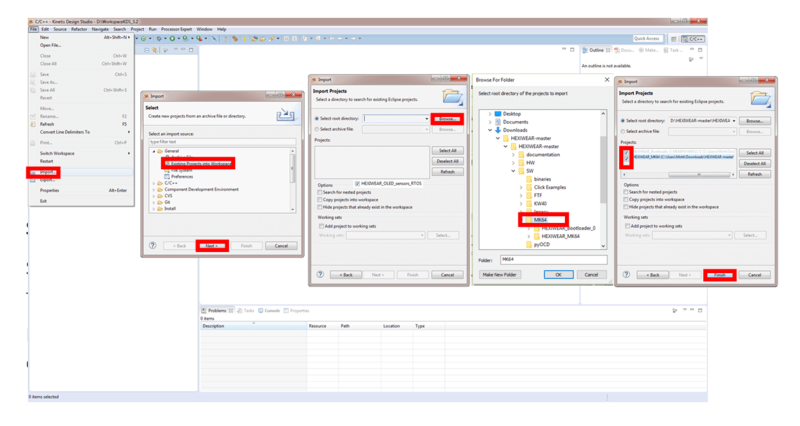 In the window that appears, expand the General folder and select Existing Projects into Workspace. Then press the Next button. 4. Press OK, then Check the box to the left of the HEXIWEAR_MK64 and HEXIWEAR_Bootloader_() project and click the Finish button in the lower right corner. Select the HEXIWEAR_MK64 project in the project explorer window and click on the Build icon (hammer) from the toolbar. Plug the Hexiwear board to the Docking Station via the specific connector. Hexiwear Docking Station embeds a hardware debug interface called OpenSDA By default it is preprogrammed with the ARM DAP-LINK OpenSDA Application, which delivers Debug, Virtual Serial and Flash Programming services. One USB to micro-USB cable is included in the Docking Station packaging. Connect one end of the USB port to your computer and the other end to the micro-USB port of the Docking station. Let’s now launch the debug session for the Hexiwear project example with KDS toolchain. Change Code for RED LED. • Changing the OSA_TimeDelay () value will change the vibration duration of the Haptic feedback motor on every click. Change the value to 200. 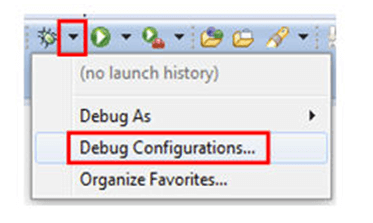 • Press the Debug icon from the toolbar to start the application. Now on every click the haptic feedback would be longer. 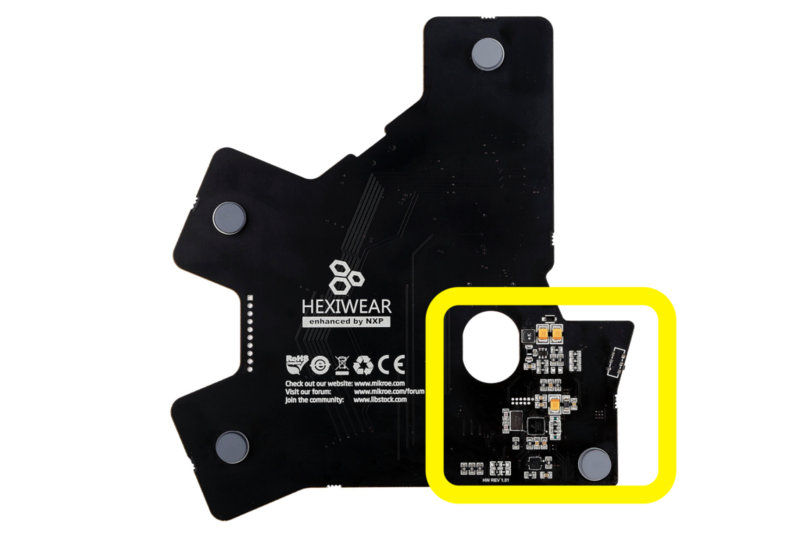 The Hexiwear Docking Station is an expansion board for Hexiwear, the wearable IoT development kit. It provides an interface for programming, debugging, and enhancing Hexiwear with additional functionalities (by adding click boards™). 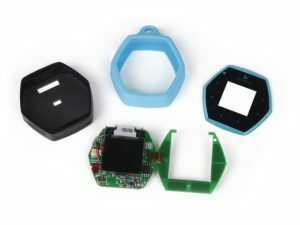 Hexiwear is a standalone development kit for IoT, designed to look and feel like a consumer-grade device. Consult the < rel="nofollow">Hexiwear user guide for a detailed overview. Every feature of the Docking Station is intended to either expand Hexiwear's functionality or to provide an interface for changing and debugging its firmware. 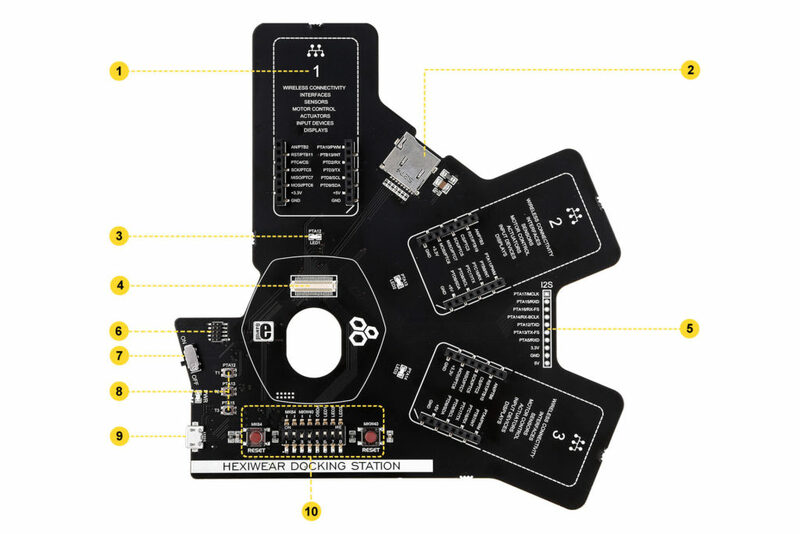 The two most important features are the three mikroBUS™ sockets, and the OpenSDA circuitry that allows you to program/debug Hexiwear through USB. The majority of components are on the front side. There is a row of 8 configuration switches right under the Hexiwear connector. Switches 1-5 are for setting up the OpenSDA programmer/debugger to connect either to the K64 MCU or the KW4x BLE MCU. In both cases, switch 5 should be set in the upper position (ON). The configuration in the image above is for programming and debugging K64 (switches 1,2 and 5 in the upper position, while 3 and 4 are in lower position). To program and debug KW4x, put switches 1 and 2 into the lower position, and switches 3-5 in the upper position. To use the Docking station with an external programmer (through the JTAG connector), switch 5 should be in lower position. The remaining switches (6-8) are for choosing whether PTA12, PTA13 and PTA14 pins are connected to the Docking Station LEDs (the pins can also be used as GPIOs (refer to the schematic to see how specific pins are routed). The click board eco-system vastly enhances Hexiwear's potential as a development tool. 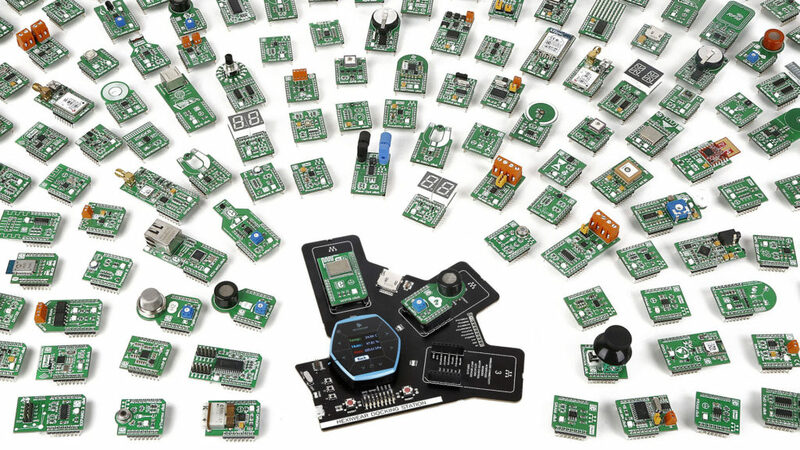 Hundreds of sensors, actuators, transceivers, displays, ports, encoders and interfaces are available on click boards – add-on boards with a standardized connector and form factor. See all available click boards™ on MikroElektronika's website. OpenSDA is an open-standard serial and debug adapter. It bridges serial and debug communications between a USB host and a target board microcontroller (K64 and KW4x in case of Hexiwear). The hardware circuit is based on NXP Kinetis K20 family MCU and an integrated USB controller. OpenSDA features a mass storage device (MSD) bootloader. Learn more in the official user guide. If you have connected the Docking station to your PC, and it appears as “MAINTENANCE” without holding RESET button while turning the Docking station on, there are two possible reasons why this is happening. -Just copy it to the “MAINTENACE” mass storage. II) Second possible reason is that you somehow erased, or corrupted one of the MCUs that is turned on on the DIP switch on the Docking station at the moment. This is happening because if your Hexiwear’s MCU is empty, the docking station with the Hexiwear on it would appear in “MAINTENANCE” mode. Turn off all switches on the Docking station except of the OSDA, which needs to be turned on. Connect the Docking station with Hexiwear on it to your PC and then turn the Docking station on.